Growing up in an Italian family, life centered around the kitchen. My Father is a fantastic cook, and I owe much of my skills and love for cooking to him. On the weekends, there was always something marvelous cooking and the house would fill with aromas that would make me and my brothers drool. I know now that we were spoiled to have such wonderful home-cooking as kids. So, I want to give a public “Thank You!” to my Father for taking such great care of us. I love you, Daddy! On that note, among my Father’s arsenal of recipes was his chili, and dang, his chili was soooooooo good. 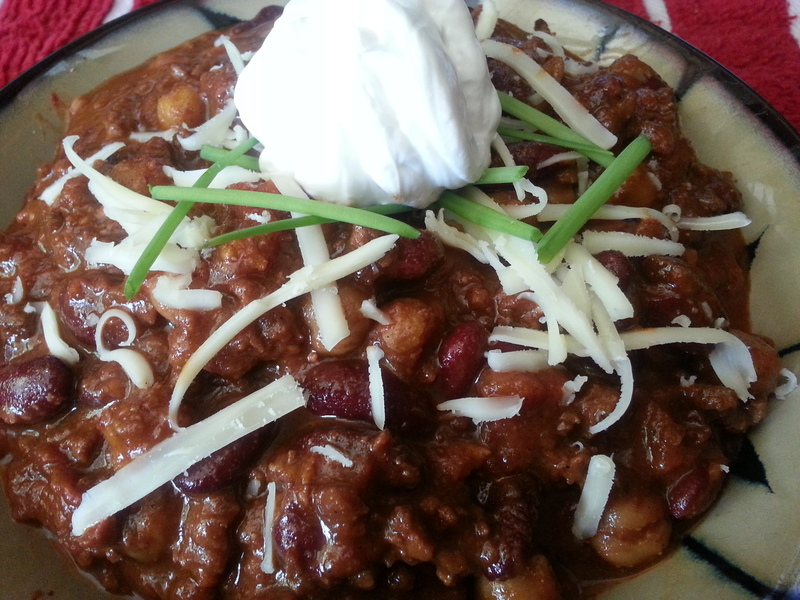 I will note that my Father did not like “yankee chili” with beans in it … so his was a good ol’ meaty chili recipe. 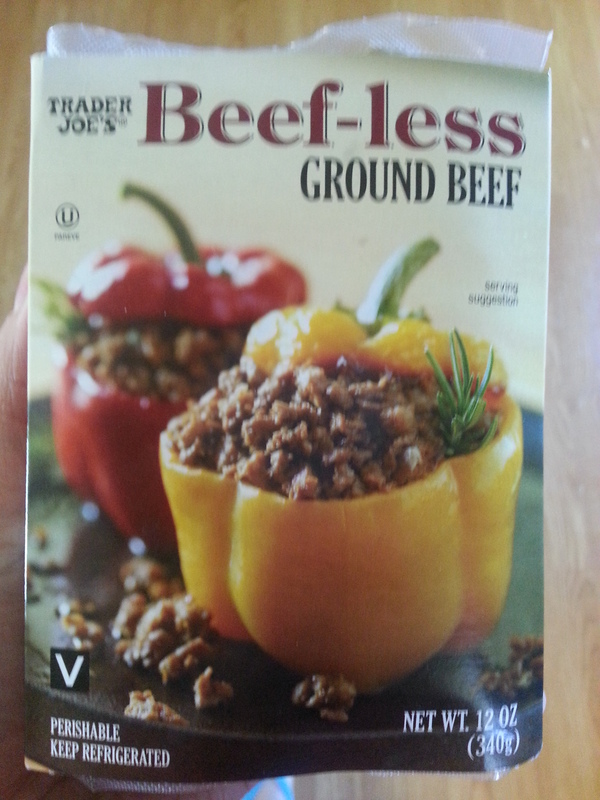 Here is my vegan twist on this family favorite. 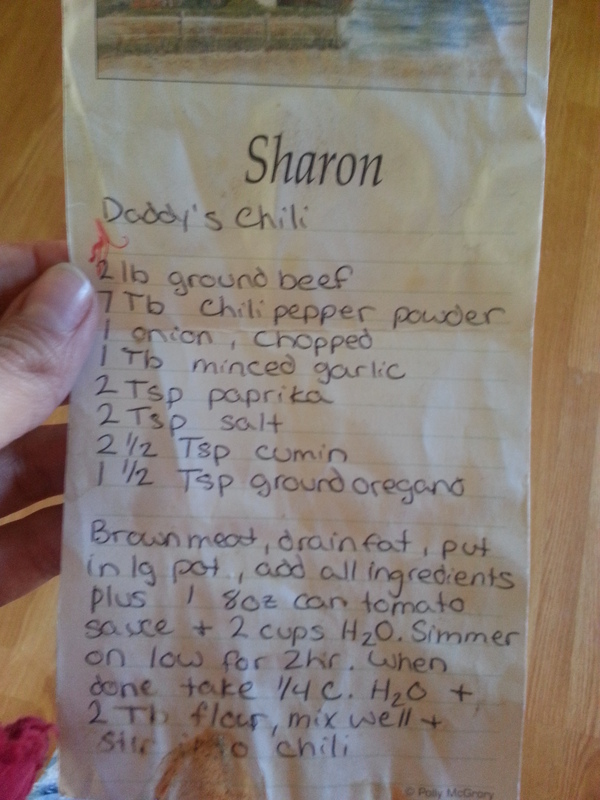 This is a picture of the original recipe … note the wrinkles in the paper, the real chili stain on it, and the fact that is written on some personalized stationary my grandmother gave to me when I was very young. some Oven Dried Tomatoes (for extra flavor) optional if you don’t have the time to make them … but I’m glad I added them, it gave the chili a great depth of flavor. 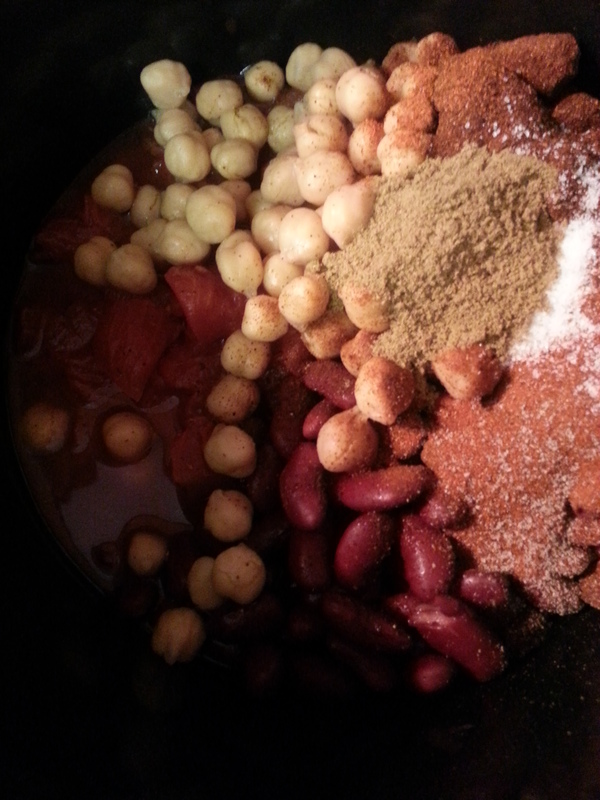 With the crock pot on high, add the beans, onion, garlic, seasonings, tomato sauce, and broth. 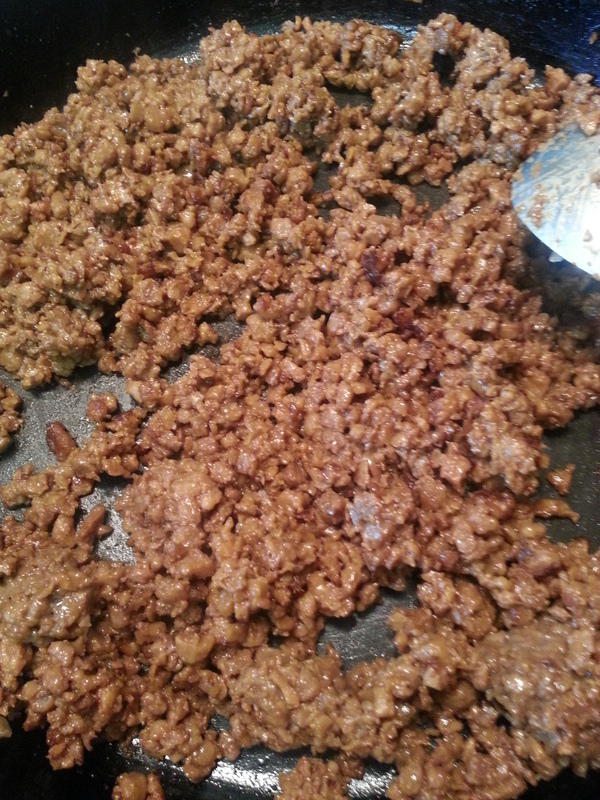 Meanwhile, brown the beef-less ground in a skillet. Season with salt and pepper. Add the ground into the crock pot, stir everything to combine. Cook on high for 4-5 hours, low for 7-8 hours. Mine was nice and thick, so I didn’t need to make any slurry to thicken it up. I served mine up with some grated cheese, and a dollop of vegan sour cream. 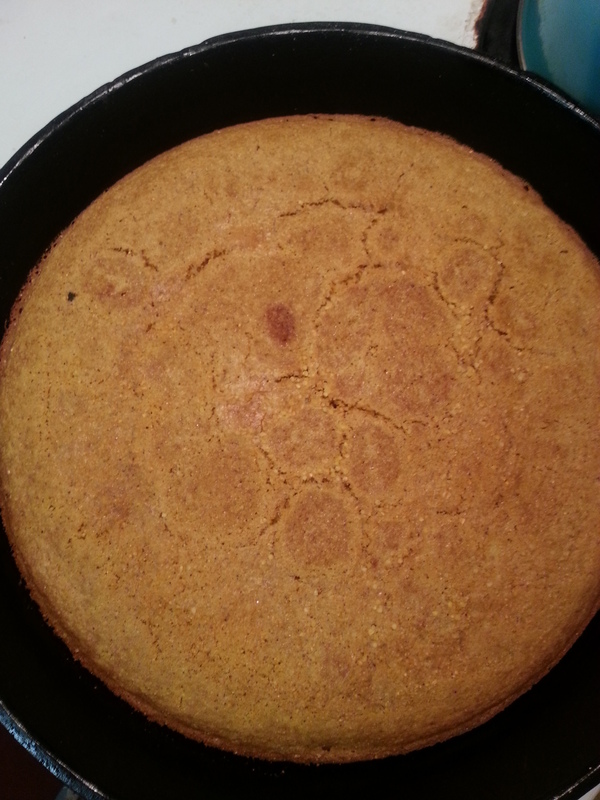 I also made this fantastic Cornbread recipe from Rural Spin. It was delicious! This was the perfect way to warm up on a cold October evening. I hope you enjoy it as much as we do! Thanks again, Daddy! What’s your favorite comfort food? A family recipe, perhaps? Please share in the comments! Until next time, I send you peace, love, and good energy!